When exploring the 2018 Mazda CX-5, let’s just put it out there: the entire CX series stands as a ‘win’ for Mazda, in several categories. Design, performance, and technology tend to be the cornerstones of comparison, and we’ll explore those a bit. But there’s clearly something special about Mazda, as of late, appreciable in the way that sleeper hits often are. But the positioning of the CX-5 within the segment means it’s easily overlooked. Depending on which of the three trim levels you opt for, it is priced to start accessibly from $24,150 to $29,645 MSRP, keeping it competitive against in-class rivals. With that in mind, let’s see if we can help it to stand out a bit. No discussion of Mazda’s current line-up should be had without some credit paid to its KODO design philosophy. Claiming to emulate natural elemental states such as the flow of water, or blowing of wind might make it sound like someone on Mazda’s marketing team is working overtime. However, the overall design of the CX-5 (and its stablemates) presents a clarity of vision, resulting in a beautifully sculpted aesthetic. Compelling when viewed as a whole, the CX-5 is ripe with countless details that one must examine close-up in order to truly appreciate. Powered by a 2.5-liter four-cylinder engine, paired to a six-speed automatic transmission, the CX-5 channels 187 horsepower and 186 lb-ft of torque. It comes standard in a front-wheel-drive configuration, with all-wheel drive optional, and offers some of the best handling within the segment. With an infotainment system built around a 7-inch touchscreen interface (with rear camera) and four-speaker audio (with USB input) the Bluetooth-enabled (base) Sport trim may not grab too much attention off the bat. But consider the inclusion of driver assist safety features, such as (i) forward collision warning (ii) collision mitigation and (iii) blind spot monitoring, with rear cross traffic alert. Jump trim levels, and these safety features expand to include the full i-Activsense suite. Build in navigation can be added, as can an audio upgrade to a 10-speaker BOSE system. Convenience features such as power liftgate and luxury features like a power sunroof add further enticement. It could be argued that some of Mazda’s greatest strengths grow visible through exploring the minutiae. Boasting ambitious design, technology and performance stats, the CX-5 stands with far more confidence than one might expect. Granted, every consumer is entitled to their own palate and exploration of status-symbol purchases; but the 2018 Mazda CX-5 is a perfect example of just how upmarket Mazda has set their sights. Sure, it can compete with the likes of the Honda CR-V and Toyota RAV-4 without batting an eyelash, but it’s impressive to see how well it can compete with more luxury offerings. Don’t believe us? Here’s a look at how well the CX-5 measures up against ‘the ultimate driving machine’ (in the form of a BMW X3). 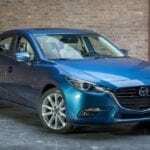 While the comparison (courtesy of Perpetual Radio Networks YouTube channel) makes no suggestion that Mazda can rival the likes of BMW, it does provide a strong argument for just how far Mazda has come in terms of its overall design and engineering. Frankly, it makes us wonder if we’re giving Mazda enough credit. Next post: Do I Like the Ford Flex, or Not?